Thoughtfully designed new Colonial perfect for today’s lifestyle. Inviting front porch, formal rooms, enviable open floor plan, gourmet kitchen, master suite, finished lower level, central vacuum, security system, generator and walking distance to Rye Golf Club and Osborn Elementary School. Available August 2019. Rendering for illustrative purposes only. Renovated Colonial on quiet street in sought-after Milton Point neighborhood. Enviable open floor plan, vaulted ceilings, 3 fireplaces, master suite, radiant heat, custom closets and much more. For me I think fennel is an under appreciated vegetable, it is delicious here with pork chops. Make the brine: Put salt, sugar, bay leaves, peppercorns, allspice and fennel seeds in a bowl. Whisk in 4 cups water to dissolve salt and sugar. Put pork chops in one layer in a glass or plastic container. Pour brine over to completely submerge chops. Cover and refrigerate for at least 2 hours, preferably longer, up to overnight. Remove chops from brine and pat dry. Discard brine. Cook the chops: Heat oven to 400 degrees. Set a wide, heavy skillet over high heat and add olive oil. When oil is wavy, add chops in one layer and let brown for about 3 minutes per side. Remove chops from pan and set aside. Reduce heat to medium-high and add sliced onion and fennel, stirring to coat with oil. Season with salt and pepper and cook, stirring, until beginning to color, about 5 minutes. Stir in garlic and crushed fennel seeds and turn off heat. 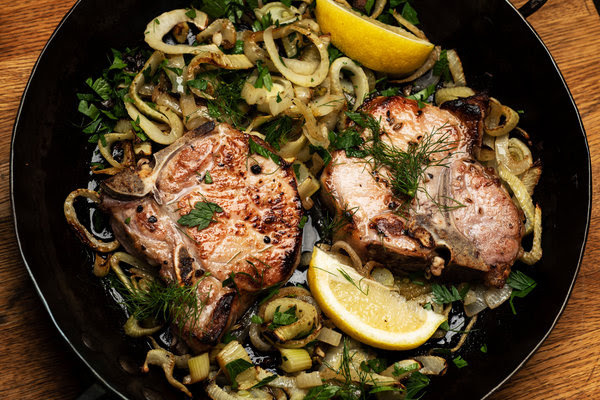 Lay the chops on top of the onion-fennel mixture (alternatively, transfer all of it to a baking dish) and place pan, uncovered, in oven for 20 to 25 minutes, until the internal temperature of chops is 140 degrees. Remove chops and let rest for about 5 minutes. Transfer onion-fennel mixture to a platter and keep warm. Cut chops into 1/8-inch slices and add to platter. Sprinkle with parsley and garnish with fennel fronds. Serve with lemon wedges. Contact me for a private showing or stop by the open house this Sunday. Registration is closed to participants but still a fun day to come downtown and encourage the children and enjoy this annual event. Activities include: pumpkin painting, live music, petting zoo, donuts and apple cider, face painting, hay rides, bouncy castle and more.